Welcome to the Coloma Convent Girls’ School website. Thank you for visiting, and we hope you find your time here enjoyable and informative. Choosing a secondary school for your daughter is one of the most important decisions a parent can make. We understand it can be a daunting endeavour, and as such we aim to help to make it as easy and painless as possible. 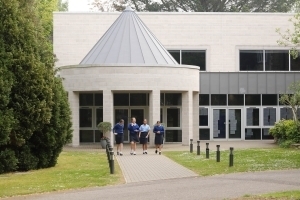 Founded in 1869 by The Ladies of Mary (now known as The Daughters of Mary and Joseph), and situated in the extensive grounds on the edge of the Addington Hills, Coloma offers a World Class education, a status awarded to the school in 2016. Here at Coloma, we have a distinctive Catholic ethos, and we aim to help every girl reach her full potential, both academically and personally. We strive to develop each student’s confidence in herself and inspire them to reach for excellence in all they do. We hope you enjoy exploring our website, and learning more about Coloma and all we do. Wishing our Netball 1st team the very best of luck at Surrey Finals today!! ⛷ Ski Trip Update ⛷ We safely arrived back to school at 9.30am. Thanks to all the girls for a great trip!